As coffee and coffee houses became an integral part of social life, coffee became the only drink in the world to have spawned a whole related culture. 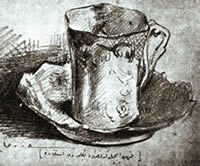 Ever since the first coffee house opened in Istanbul in 1554, coffee has had a tremendous impact on art and culture. Countless artists, students and teachers have come together in coffee houses to read books, perform plays and hold lively discussions. This situation is not exclusive to Istanbul; throughout the world, coffee houses serve as meeting points for intellectuals and coffee has long been the favourite drink of artists. For many years, coffee has been the chosen beverage of artisans; for artists and thinkers such as Alexandre Dumas, André Gide, Molière, Victor Hugo, Honoré de Balzac, Voltaire, Ludwig van Beethoven and Immanuel Kant, coffee was much more than a drink; it was a lifestyle. Coffee has served as a platform for friendship and conversation all over the world and has been a source of inspiration for many works of art. Coffee and Music Many renowned musicians have been inspired by coffee, Antonio Vivaldi and Carlo Goldoni even composed a work entitled "La Bottega del Caffe". Yet the musician on whom coffee had the greatest impact must be J.S. Bach. This great musician poured his love of coffee into the notes of the Coffee Cantata, which was published in Leipzig in 1732. Bach composed the Coffee Cantata around a poem by Picander. He was inspired to compose the cantata out of protest against the fact that Germany was trying to outlaw the drinking of coffee by women as he felt that the appreciation of coffee should not be subject to sexual discrimination. Let him pour me coffee!